When working with any professional entity, there is a level of expectation and professional conduct you expect to experience throughout your engagement. Knowledge, expertise and well-trained staff who excel in their field are essential requirements for working with any physical therapist. What really sets Miller PT apart from other clinics, is that aside from unsurpassed knowledge and professionalism, we have a client-centric environment. This means that from the moment you open the door until you leave our care at the end of your treatment, we do all that we can to ensure your experience is like no other that you would receive anywhere else. Your health and wellness goals are as important to us as they are to you. Whatever brings you to physical therapy and to our practice, we have the education, equipment, and modalities to meet your needs. What differentiates us from other PT clinics is you will always know that your comfort, progress and client experience comes first. Our mission is to provide each of our clients with an outstanding experience. We want to raise the standard of customer care and experience. We see you as an individual, which means every moment of your journey with us is tailored to meet your needs. By providing each client with unsurpassed service, we believe we can raise the industry standard and demand service that meets unprecedented heights. The ways in which we center our practice around you are as diverse as the people we work with. From the ease of making and changing your appointments, to the non-existent wait times when you arrive, we pay attention to the details to make sure your needs are met and your experience while you are with us are effortless and hassle-free. Upon arrival, you will be greeted with a friendly smile and a welcoming hello. Our pristine, state-of-the-art facility will meet your physical needs, while our friendly, accommodating staff will act as your health consultants. We will advise you on healthy lifestyle choices that will set you up for success well beyond your immediate healthcare goals. We will be your liaison with your medical team, ensuring we provide you with whatever is needed for you to achieve your goals. In short- we want you to be able to focus on getting better- we will take care of the details! We provide you so much more than just physical therapy. Our staff are courteous, professional and knowledgeable. Our years of experience and passion for client care sets us apart from other PT clinics, making us the ideal option for you! 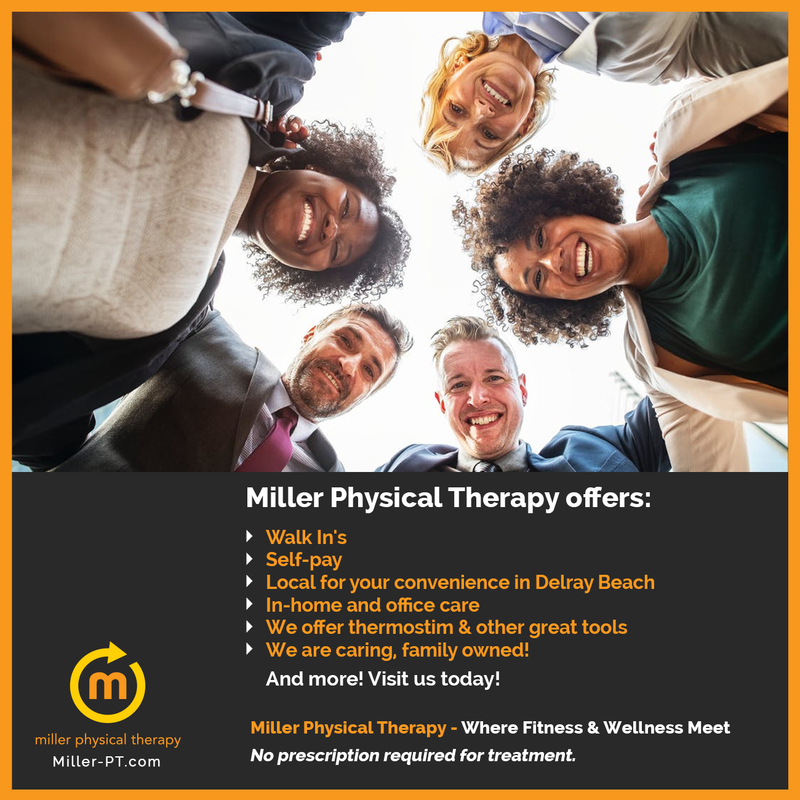 Visit our Facebook at www.facebook.com/millerphysicaltherapydelraybeach or give us a call at 561.278.6055 to see all that we have to offer you and make your experience with us a truly wonderful experience!